Tomsk has none of the historical pomp and circumstance of Russia's two major tourist destinations, Moscow and St. Petersburg. For the traveler who hankers for something besides glittering churches and postcard-familiar scenery, Tomsk offers something more subdued. Wooden houses, like those out of a favorite Russian fairy tale, line the streets in various stages of repair or renovation. The many universities give the town a learned, serious atmosphere. And the museums are heavy with the gravity of Siberian history. Set in the midst of miles of taiga, Tomsk has a quiet dignity. The best time to visit Tomsk is in the summer: June, July, or August. The sunny, warm days are perfect for taking walks in Lagerny Sad, the war memorial park that looks over the River Tom. The residential neighborhoods are full of points of interest, and the downtown area is great for shopping and eating. However, even on rainy days, you can find something to do. Not only is there a recently established art museum, but the Tomsk Regional Museum gives an in-depth look at how the peoples of Siberia once lived. For those who want something special, it's imperative to check out the KGB Memorial Museum. Located in the original Tomsk KGB headquarters, it is a reminder of the terror of the Communist years and the many labor and concentration camps that were set up in the Tomsk region. The holding cells for prisoners also contain their stories of survival; a rotating exhibit honors the art, literature, and lives of those who were brave enough to fight against and tell about their experiences at the hands of the KGB. The museum is the only one like it in the country, and visitors can see Solzhenitsyn's signature in its guestbook. 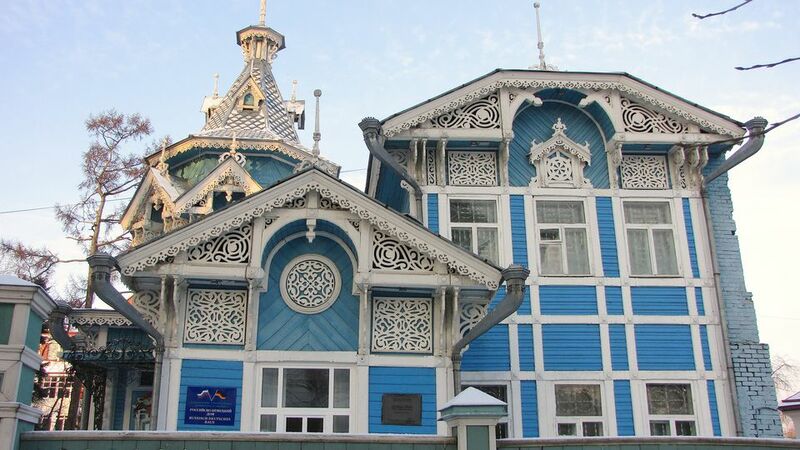 The wooden houses are a point of pride for the people of Tomsk. Many of the more elaborate ones have become symbols of the city. The windows are bordered with elaborately carved wooden decorations, some in themes depicting birds or dragons. Some of these buildings are still inhabited, which seems a decent metaphor for the way the past in Siberia maintains a symbiont relationship with the present. The rare Westerner in Tomsk will be met with wariness and curiosity, though seldom hostility. Anyone who shows interest in Tomsk or the Siberian way of life will make friends quickly. Tomichi, the citizens of Tomsk, love to have guests and to share their warm Russian hospitality with foreigners. Their knowledge of their city and of Siberian history can make a stay in this town especially meaningful. You can meet them at the American Center near Tomsk State University, at the central fountain where many Tomichi congregate during the evening, over drinks at one of the many bars, or even on the bus. Any foreigner tends to stand out, but this can be an advantage when trying to make friends. One of the most delightful aspects of a Siberian summer is the food. The markets are full of delicious fruits and berries, all of which are at premium pricing for the traveler who is used to paying an arm and a leg for sub-par produce. There is an extensive variety of cheese and other dairy products, free from the processes that often make US diary bland and lacking consistency. At certain times of the week, you can visit stalls that sell meat freshly butchered or fish freshly caught. Be sure to be aware of any old woman by the side of the road with vegetables for sale - they're almost always home-grown and delicious. Tomsk is a part of Russia that is unique for the Eastern European traveler. Its small size and community atmosphere, along with its proximity to vast pine forests, make it an escape from the big city Russia that most tourists are familiar with. Fourteen hours by train will take you to a bigger city, Krasnoyarsk, and then you can ride the Trans-Siberian railroad on to Novosibirsk. However, given Tomsk's character and quality, it is unlikely any visitor will be in a hurry to leave.